Iron County Wisconsin, including the towns of Mercer and Hurley, is filled with wonderful scenery and rich iron mining heritage. It is an excellent choice to spend a week or weekend exploring all this area has to offer. The Chippewa and Flambeau Improvement Company created the Turtle-Flambeau Flowage in 1926 with the damming of the Turtle and Flambeau Rivers. The dam, built to generate energy for the Flambeau Paper Corporation created a body of water 19,000 acres in size, encompassing 15 lakes, three rivers, and several creeks. Over the years, the flowage has had many visitors, some of them notorious, adding fodder to the area's history. John Dillinger frequented the area. The movie Public Enemies staring Johnny Depp as Dillinger was filmed at the Little Bohemia restaurant in Manitowish Waters just a stones throw from the flowage. Al Capone, the Chicago gangster, fished the flowage area many times, especially in the years after he was released from prison. Charlie Comiskey, the founder of the White Sox baseball team, fished the Trude Lake area of the flowage with his team members. The State of Wisconsin acquired ownership of over 23,000 acres (95%) of the land surrounding the flowage, including 114 miles of shoreline and 195 islands, ensuring that the Turtle-Flambeau Flowage will remain one of the largest wilderness waters in Wisconsin. The Turtle-Flambeau Flowage is truly the Crown Jewel of Wisconsin! The Turtle-Flambeau Flowage invites people who enjoy the solitude of a vast wilderness to pursue their limit of walleye, smallmouth bass, musky, northern pike and panfish. A guided fishing trip and sightseeing tour down the Flambeau River with the friendly folks at the Midway Bar is a must during your visit. 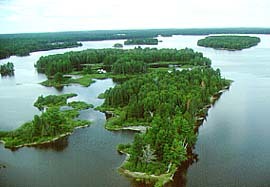 Walleyes: The famous Turtle Flambeau Flowage, (19,000 acres of water) is rated by the Wisconsin D.N.R. as having one of the best walleye populations per acre of water in the state. Laid out with open mud flat areas, miles and miles of river channels, log jams, rock, and sand shorelines, submerged as well as visible stump fields, hundreds of center lake rock and mud humps, back bays, islands, bogs and numerous weed beds makes for excellent fish habitat. Smallmouth Bass: Although known for its fantastic walleye fishing, the Turtle Flambeau Flowage also boasts a excellent population of Smallmouth Bass. With 19,000 acres of superb smallmouth habitat, abundant feed, and acres of prime spawning areas the small mouth population on the Turtle Flambeau Flowage has exploded. Commonly referred to as “footballs”, the Turtle Flambeau Flowage produces a much heavier smallie than the average inch to pound ratio than most other bodies of water. From early spring to late fall the small mouth can be found roaming the various structures of the TFF. Musky: In order to determine the status of the musky population, survey crews returned after the walleye spawning season to obtain information on the general health of the musky population. A total of 253 musky were captured through this effort. Of the total fish sampled, 14% or 36 fish were larger than 40 inches in length. 30% (76) were greater than 36 inches. The largest musky sampled was 51+ inches in length and over 45lbs. Based on this survey, the Flowage continues to demonstrate its ability to provide outstanding trophy musky angling opportunities. 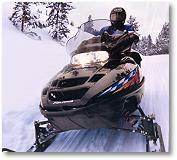 Snow blanketed forests filled with the sights and sounds of the Wisconsin Northwoods is what lures many snowmobilers to Iron County. Boasting nearly 200 inches of snow annually and over 450 miles of meticulously groomed trails are great reasons to set your sights on this beautiful county for your next riding adventure. From our location on the Turtle Flambeau Flowage you will find trails going in all directions with ample trail-side services along the routes. A choice trail of interest is Corridor 8, which travels west of Mercer past Lake of the Falls scenic area and the Turtle Flambeau Flowage. This trail meanders through beautifully wooded well groomed trails on its way toward Ashland County. Nature loving riders enjoy an adventure on Trail 19 as it winds through the Northern Highland American Legion State Forest south to Manitowish offering scenery snowmobilers must experience to appreciate. Trails of interest throughout this county are numerous. A few favorites are Corridor 2 north-west of Hurley which passes near Rock Cut Gorge, a popular scenic point of interest, along a scenic journey toward Saxon. Another is the trip on Trail 3 to quaint Saxon Harbor nestled on the shores of majestic Lake Superior. A journey on Corridor 17 guides riders south along the Upper Michigan border past beautiful Pine Lake. This trail crosses many rivers and creeks offering excellent viewing of wildlife and the natural splendor common to Iron County. Trail 77 takes a southwestern course through the rich historic iron mining towns of Montreal, Pence and Iron Belt with a unique opportunity to view the Plummer Mine Headframe. This is the only remaining mine headframe in Wisconsin. In the southern section of Iron County, Springstead located on Trail 182, welcomes riders to enjoy well marked trails that wander through dense snow covered forests for a unique winter experience. Please call between the hours of 9 AM and 9 PM. If you leave a voice mail message your call will be returned as soon as possible. Please call on land line between the hours of 8 am and 10 pm. If you leave a voice mail message your call will be returned usually within 1 hour. These are some of the comments from our guest books. We thank our guests for being our best spokespeople and for giving us the opportunity to share the awesome Turtle Flambeau Flowage experience with them throughout the four seasons! We had a wonderful time again :) Trails were great and returning to the cozy cabin was a fabulous way to end the night. Thanks for a great weekend. See you again soon! Go Pack Go! What a beautiful place to stay. Everything was so nice and clean and thank you for the gift of jam. Even though the weather was quite cool, we sure enjoyed the beautiful scenery and the many games we played on the back porch. The week went by so fast and we hated to have to pack up and go home. Thanks again for a wonderful time. "Tuesday we ended up with 7 crappies and 2 walleyes. Wednesday we ended up with 9 crappies and 3 walleye with the biggest walleye being 19". Thursday we ended up keeping 3 crappies and 1 walleye throwing back 3 bluegills and 1 crappie. By the sounds of it we had a successful fishing trip compared to others who ice fished yesterday. Used the wheelers to get out on the ice as there was only approx 12" of ice out. The cabin was beautiful and spotlessly clean and we enjoyed our stay here on Lake Bastine. Although Trivial Pursuit proved challenging we enjoyed all the cabin had to offer. Thank you:)!" "Fishing great first three days, all seven of us took home fish. Mostly crappie with some small walleyes. Wednesday we mostly we stayed in the cabin and watched movies. It sure is nice to have a warm and cozy cabin. Thursday fair, few fish. Friday snow, we left at noon. The Gang"
"Thanks for a whole new experience on the flowage. Cabin was perfect! And the fish were biting! Looking forward to next year. "Beautiful fall color, crisp cool air and a first place win for Ken & Tim in Donner's Bay Walleye Tournament! Thanks for the great weekend!" "We all had a wonderful week - who would think you never needed sweatshirts in September. Mostly sunny & warm with cool nights. Enough fish for a fish fry. A lovely place to play Scrabble, word puzzles and enjoy the grandchildren. A great canoe trip around the Big Island (including a portage into Merkle). Everything is first class - the cottage, the canoes, the fire pit. Thank you, Thank you!" "Thank you for the hospitality, the cabin was awesome! The weekend was overdue for all of us and much appreciated. We look forward to a return trip to improve our musky luck!" "Perched high the Flambeau Vista...the summer lake laps the sandy shore carrying its cargo of dip and bob ducks, crawling crayfish, plump bass & crying loons. Overhead the eagle soars circles amid puffy clouds that pillow the sky so blue and the full glory trees clap as a warm breeze jostles their leafy hands. Hrummm - busy hummer sips the nectar storing, storing for the glory of summer is short, but the summer memories last a lifetime. Thank for the lovely retreat." "We had a fantastic week all around! The weather was perfect, the trails, and fun on the lake. The cabin is beautiful and perfect for our needs. Thank you for providing such a wonderful place for us to enjoy. We are already looking forward to next year!" "Opening week of Walleye. Fantastic cabin, super hosts, great fishing. Will be back and tell all our friends." "PBR Racing Team was here! Thanks for the great stay!" "Thanks for a well equipped and clean cabin. The weather was quite cool, so no swimming was possible, but we enjoyed ourselves anyway! The men were able to catch some fish on Saturday." Lake Summerset, Il. "Thanks so much for the use of your beautiful cabin again this year. Our 4 year old wants to live here forever! The sunsets are so pretty and also the sunrises over the lake in the canoe. We could not have asked for more wonderful weather. I sure missed the hummingbird feeder this year. I also used some of your flowers and driftwood for the background of my daughter's senior pictures. This is beautiful and peaceful up here. See you next year." "Thank you for a great family vacation. This was our second time here & we love it! Our son & his wife from San Diego, CA & our daughter with her hubby and our two grandsons from Liverpool NY had a great time...our grandson Jacob caught his first fish (3 1/2 yrs. old) what an experience for him." Marshall, MN. "Wow...what a great cabin! All the small touches really made us feel at home. The 4-wheeling was fun & cold, but the fireplace warmed us right up! We are so happy to have found this place & will certainly be back! Again - thanks for the bottle of wine and a great honeymoon retreat!" "You guys did an awesome job with the cabin. I can't believe that we were able to find such a great place on short notice! We brought our friends from Pennsylvania to the Northwoods for their first time, and they all want to come back here soon. Your cabin is so beautiful and in such a nice location...I'm glad we were able to find your website :) Hopefully we'll all own snowmobiles next winter so we can try some of the trails around the cabin. We plan to come back here whenever we can, maybe this summer, if not next winter. Thanks for the wonderful memories!" "We had a wonderful family vacation in the Northwoods. The cottages were beautiful and so cozy. Our families enjoyed snowmobiling during the day, sledding down the hills with the kids or just hanging out playing games. Our evenings were spent making meals and all sitting together reflecting on our day and family stories. We look forward to our next trip up here with more family. From our family to yours - thank you!" "- 22 on the Reinhard's porch...but the car started...so all is well & cozy! We, & our part-time guests have had a great week. you provided us all the "small things" which make a stay so pleasant after discovering that the mouse in the kitchen wall was really the fish clock chiming the hour, Ginny let me put the spatula away & come into the living room with everyone else! Our best to you & many thanx!" "A big greetings from Europe. I and Dan had the most lovely time in the Reinhard's cabin. Thank you for such a nice opportunity to spend our holiday in your unique, cozy cabin with such warm, romantic environment. I like a lot the design of your cabin. Keep going like that and we are looking forward to spend our free time again in such a lovely cabin like yours. A big hug from Belgium." "You got it right when you redesigned "the cabin" and kept the original "bones". It is a special place! The setting didn't hurt either! Getting up in the morning and seeing the mist and reflection of the trees over the water is one of the things I will remember. Thank you Kathy & Scott for providing a memorable environment for a much needed R & R. Appleton, WI"
"We totally enjoyed the beauty of this cabin & the gorgeous lake & setting. The cabin has all the amenities you need - all the details & decorating - you know Kathy & Scott put a lot of time into this place. Remember to hold hands up here! P.S. I'm glad Kathy is a "neatnik"!" "We had great great weather in "mud month" temps approximately 50 degrees. Enjoyed walks along with the rocks and the boys were in heaven riding bikes around here! Your cabin is great - your new cabin is going to awesome too. Thanks again. Duluth, MN P.S. We saw the walleye spawning. Scott took us there. It was cool. When we went to the big rock we cont get on the big rock. So my dad said to put my foot on his hand and crol on the rock. It was cool." "Thank you for the use of your beautiful cottage. We all had a great time snowmobiling, sledding, x-country skiing and just being together. You have a beautiful piece of property. The boys loved the loft :). Hope to see you again." "The cabin was awesome, the best one we have stayed in for deer season. We had 2 guys from our group get a deer. We all had fun and hope to make it up again next year." "We enjoyed a beautiful fall weekend. We caught a lot of fish in the Beaver Flats on Friday and several nice fish on Saturday. We loved the cabin and enjoyed the surroundings. This was the first trip my brother and I took with our dad in quite some years. Hopefully we’ll be back next year. We had an awesome trip. Thanks for everything." Muskego, Wisconsin. 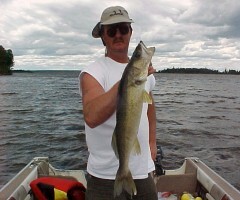 "We never fished the flowage but we’re glad we came here! The fishing was really good, walleye, crappie, perch, rock bass & northern. We had to work for them though. This cabin is so comfortable & so beautiful. All the comforts of home." Racine, Wisconsin. "This was our second stay at the Flambeau Vista Retreat, and it was just like we remembered. Neil worked on his woodcarving project, and I on a cross-stitch project. Our three cockers, Daisy, Cocoa & Lady enjoyed lounging around and barking at the ducks and deer we saw on our walks. As last year, it was very quiet here – which was appreciated." Sheboygan, Wisconsin. "The weather was perfect, especially the rain during the night! The three weeks were relaxed and rejuvenating – especially for the fisherman. I read a lot of your books & enjoyed the quiet and lovely surroundings. We perhaps will see you next year, but as a number of our elder friends say – “We don’t buy green bananas anymore”. Thank you for a great three weeks." Louisville, Kentucky. "Our group has been around to a lot of places over the last 20+ years, recently staying at Flambeau Vista on the TFF, awesome place, and the owners are the best. Scott stops by to see how things are and shoot the bull for awhile. I think he's such a happy guy because of Kathy! Hahahaha! One of our best experiences! Plus the fishing is great." Oconomowoc, WI. "Our Valentine weekend – the scenery is beautiful! Our snowmobile trip was exciting and adventuresome. The trails were awesome! So although we spent more time on the trails – it was comforting to come back to a warm and cozy cabin. Thanks for sharing your “Up North” with us!" McHenry, Illinois. Please call between the hours of 8 AM and 10 PM. If you leave a voice mail message your call will be returned as soon as possible.